Darren Clarke is backing Ryder Cup skipper Colin Montgomerie in his quest for three wild cards next year. But that will put them on a collision course with triple major winner Padraig Harrington, who is dead set against changing the current system that gives the captain just two picks. The issue will be hotly debated by the Tournament Players' Committee at Baltray next Tuesday with Clarke set to give the move the thumbs up. Clarke said: “I will be voting for three picks and I also will vote that we take one place off the World Points table. Harrington was disappointed that Europe lost to the US at Valhalla last September but doesn’t want the two-pick system to be changed, insisting: “I think our system has produced a winning team more times than not and I think we should stick it. “Two picks gives enough places for the guys on the World Rankings and for the guys on the European Money List to qualify for the team. I think the system has been excellent. US skipper Paul Azinger went from two to four wildcards for the matches in Valhalla, where the USA ended their nine-year victory drought with a five-point win. Padraig Harrington has called on Ryder Cup skipper Colin Montgomerie to leave the qualifying system alone and avoid a wild card headache. Ireland’s triple major winner believes Monty will put on his Ryder Cup game face and bring out the best in the players without being afraid to take the tough decisions. The Darren Clarke fiasco was a major factor in Colin Montgomerie’s successful push for three Ryder Cup picks. 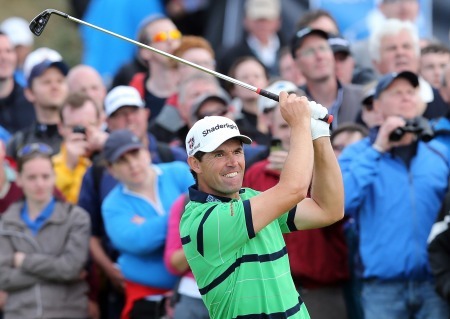 The Scot, 45, confessed that he “felt sorry” for Clarke when he was snubbed for a wild card by Nick Faldo last year.